We represented both camps! But either way – we’ve done a little web-a-search and put together a brief introduction in the most basic form to our most special specialist ingredients. So if you’re interested in how to make a pizza look like a flower, or an apricot mousse look like a fried egg, sit down, strap yourself in, and hang on! It’s fitting to get the party started with these guys. You may have discovered these after biting into a piece of commercial chocolate recently. Your mouth would have shouted “DISCO!” and it would be right … Its Popping Candy! Ours are known as Natural Pop Rocks – they’re made from natural ingredients and aren’t coloured or flavoured, which means they can fit in anywhere. But if you’ve ever had a chocolate gateau explode on you like in this Heston Blumenthal recipe, you’ll know that Popping Candy doesn’t sit in the background! Ever considered its use in a savoury dish? Salty Seattle describes making “Goose Fat Pop Rocks” by mixing popping candy with powdered goose fat (itself created by mixing Goose Fat with Maltodextrin – a product described below). Um … wowsers. Some of you may have heard of Agar Agar, most notably as the vegetarian, heat-resistant gelling agent used throughout Asian cooking. Now this little pack of powerful powder has found its way into the kitchens of patisseries for its use in the creation of the gels. These can be in the form of drops, such as tomato caviar and honey caviar, or noodles, like in this chocolate spaghetti recipe. Now let us meet some characters you might not have previously come across. Here they are listed in the simplest way as we have learnt from our research (probably heaps of other ways – we can’t wait to find out what they are!). 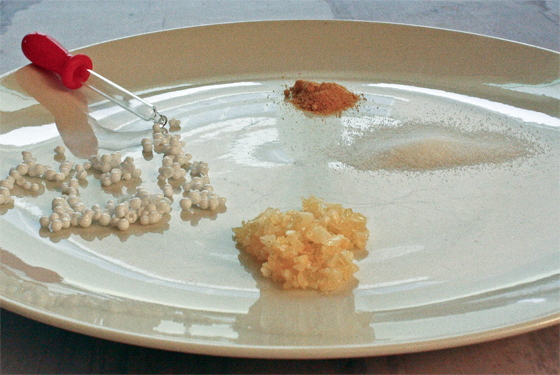 Maltodextrin: Here we have a tough little substance (actually an unsweetened starch) which can turn any high-fat mixture into flavourful little bites by converting it’s physical properties to sand. All it takes is the two ingredients blended in a food processor. We have Maltodextrin to thank for olive oil sand or nutella crumb. Soy Lecithin, otherwise known as Lecithin: This stuff creates exorbitant bubbles in any liquid you whisk it with (most recipes I’ve seen call from a hand-held stick-blender for the task). This process is called Emulsifying; turning liquids into foam. The bubbles hang around unlike if you just whipped it sans lecithin; so you can add beautiful foams or airs to your plate. Like Heston Blumenthal’s Sounds of the Sea or, after freezing, a homemade Aero bar. It’s also respected in health fields for people with allergies because it is egg-free. Sodium Alginate: Known as a stabiliser, when combined with Calcium Chloride and an acid, assists to form a thin flavourless gel. This is known as Spherification (when a liquid including sodium alginate is submerged into a bath of water and calcium chloride). The beauty of this process is that spheres or shapes of any size can be performed; see caviar (using a pippette), “ravioli” and apricot yolks! 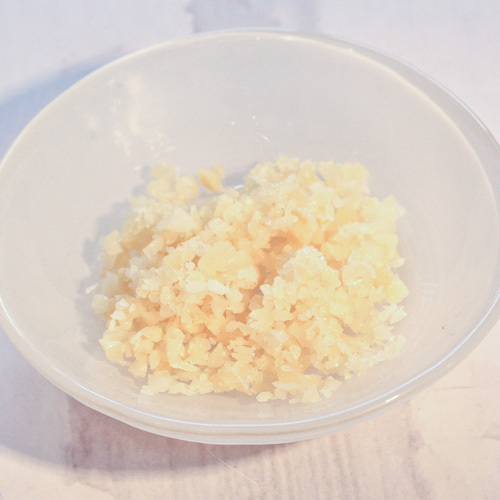 Reverse or inverse spherification is when Calcium Lactate is combined with a substance already containing Calcium, and emersed in a Sodium Alginate bath. This has been done to create spheres of dairy product (like mozzarella) or olives. Isomalt: Anyone who’s been watching the cooking shows recently will have come across Professor Isomalt. This noble gentleman turns your combination into crispy thin tuiles or glass (sweet or savoury). All you need is time (a very low oven with the door ajar to dehydrate the tuile) and a stencil of the shape you want (or a mould). Titanium Dioxide: Think of toothpaste! Titanium Dioxide is a naturally-occurring substance which creates bright whiteness in your mixture. Think the amazing V8 Cake by Adriano Zumbo on MasterChef, or the striking sugar tube in this Darren Purchese MasterChef recipe. Pectin is a natural plant product, used traditionally as a jam setter but in modern cookistry to aid in setting confectionary such as Heston Blumenthal’s pastilles, and the gorgeaus water gel teardrops atop Adriano Zumbo’s V8 cake. Gellan: Another setting agent who’s hits include Zumbo’s MasterChef Macaron Tower and this brilliant Flaming Cointreau Sorbet recipe. In the latter, Gellan’s heat-resistant properties are used to enable the cointreau flame to burn without melting the sorbet. Incredible! Both Guar Gum (legume-derived) and Xanthan Gum (corn-based) are gluten-free thickeners, so can (and should) be added to gluten-free cooking in baked goods (where Xanthan Gum is thought to be more suitable, like this lemon cake) and cold dishes (where you should use Guar Gum), like this Frappaccino. See this healthfood-based blog for more info. Xanthan Gum’s use in modern patisseries takes advantage of its capacity to thicken a substance without changing its flavour; hence Adriano Zumbo’s “Suspended Custard“. Such an exciting array of ingredients, and all readily available on our shelves! They might seem downright kooky, but in all cases are substances typically found in the processed & packaged food we buy from the shops (or brush our teeth with) … We’re eating them anyway, it seems! We’re preparing our own molecular gastronomy adventures and would love to hear of yours! Hi! Thanks for linking to my Nutella post. Good round up btw. Can you use the pop rocks in baking? (do they still pop once they’ve been cooked?) Thanks! Hi There – I don’t think so. All the recipes I know of utilise pop rocks in cold desserts or sprinkled atop. You gotta be careful with them because they can pop on contact with liquid (that’s why they go off in our mouth!). So they are usually mixed in very carefully to things. That said, I have done them mixed into melted chocolate which has worked ok. Let us know if they bake well!